Drum roll please.....we did our handy dandy randomization of our 55 Facebook “likers” and we are thrilled. We assigned each of you a number in order, and then went to Random.org to have a completely impartial drawing! 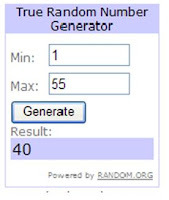 # 40 IS THE WINNER! Emily, please email wommoms@gmail.com your snail mail address so we can send you A WOM-WORTHY teacup pin cushion straight away! Thanks to all our followers and likers! Tuesday marks WOM-MOM’S two month anniversary and we are thrilled! A BIG THANK YOU TO ALL OUR SUPPORTERS! Keep following!